Is there anything more satisfying than walking out to your yard picking something to eat? 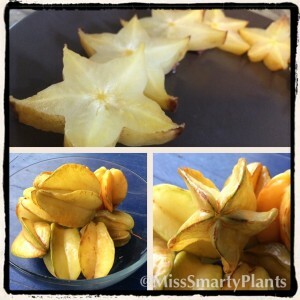 Growing starfruit may very well be one of the easiest fruits you can grow in Florida. When friends ask for a fruit tree suggestion, this is always in my top three. Now, there may be limited uses for the overwhelming harvests of fruit, but that is when you become the most popular coworker, friend and neighbor! We planted our small tree in the spring of 2012 and after a little more than two years we are regular picking fruit and certainly have more than we could ever eat. 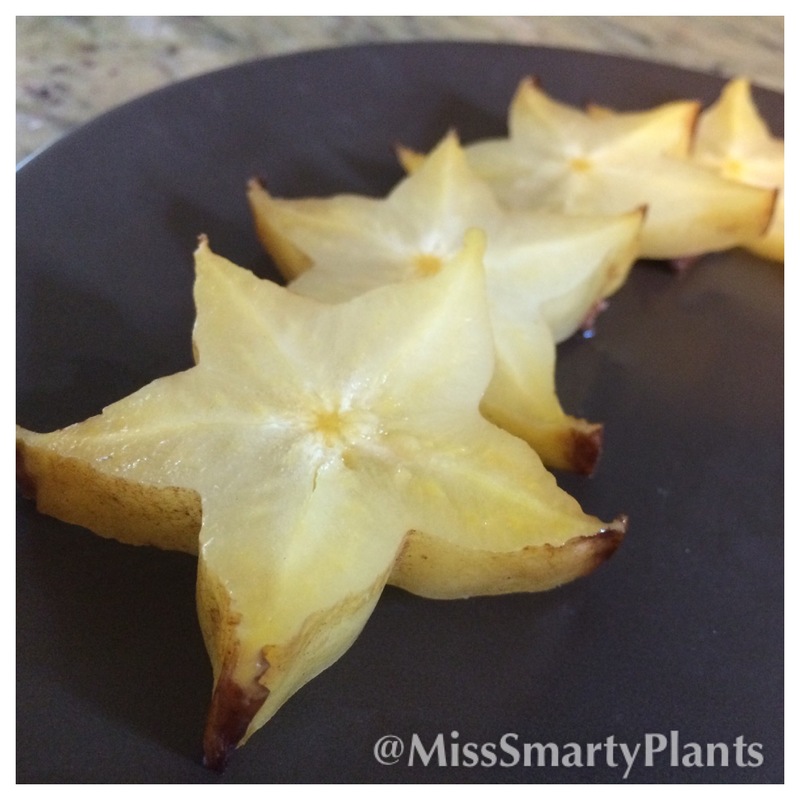 You can see in this comparison how quickly starfruit (also called Carambola) trees will grow. Today our tree is about ten feet tall, so almost all of the fruit is still within reach when we really get on our tippy toes. Over the next few months I will trim the leader branches to help keep the size more manageable for our space. while they are small. This will help the tree to continue to focus on developing a strong root system rather than putting all of it’s energy into growing fruit. Some experts will suggest removing ALL fruit the first year, but let’s be honest, that’s just not going to happen for most of us. The anticipation of picking your first starfruit is just too overwhelming! 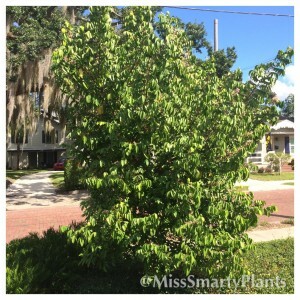 Fertilize your tree regularly as starfruit are heavy feeders. I prefer to use a palm fertilizer because it has all of the micronutrients that fruit trees need. In this photo you can see an early sign of nutrient deficiency starting to show on the leaves. Fertilizing every 3-4 months at a low rate will keep your tree growing well. You can learn more in the University of Florida’s publication here. Starfruit trees will flower almost continuously which means there will be several harvests each year. While the flowers aren’t the most showy, you will certainly notice a lot of bee activity around your tree when its flowering. Those bees are crucial in pollinating the small pink flowers- go bees go! Not every flower will set fruit, so don’t worry if there is a strong storm that knocks some of them off. The continuous supply of flowers means that you don’t have to worry about losing an entire crop due to bad weather. I was surprised to read that you can induce fruit set by selective pruning. 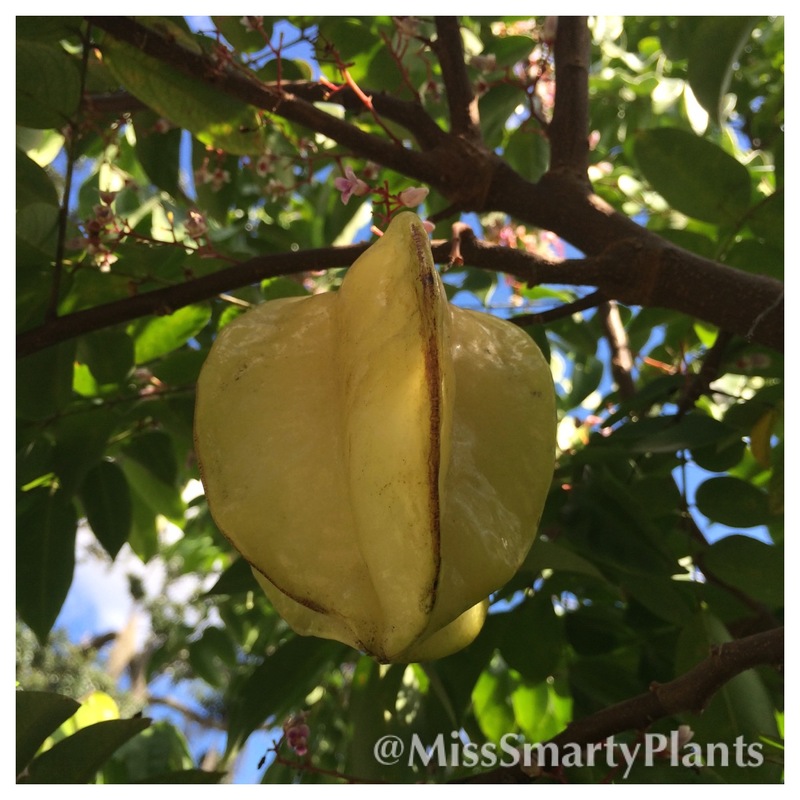 Our tree flowers and sets fruit almost continuously, so I am not sure this is necessary, but always good to know! Pruning the willow-like long shoots (“whips”) or selecting a small diameter limb and removing all the lateral shoots from this limb to their bases will induce flowering in about 21 days and fruit approximately 70-80 days later. Also, fruiting may be induced on whips by bending them from an upright position to a lateral position, clipping off the last 12 to 18 inches of growth, and clipping the leaves off but leaving a small (1/3 inch) piece of the petiole (leaf stem). The mild winter weather the past two years has helped our little starfruit tree to grow continuously. A small cold snap last year caused a few leaves to drop, but overall the tree has been in good health. According to UF, “Air temperatures of 30° to 32°F may kill young leaves; young trees, twigs, and mature leaves may be killed at 27° to 29°F. Small branches may be damaged at 25° to 29°F, and large branches and mature trees may be killed at temperatures of 20° to 24°F.” If we get to 24° there are bigger concerns than our little tree! Harvesting Carambola. Fruit are ready to be picked when they have a rich yellow color They should pluck easily from the branch and won’t require very much pull to release. If you have to tug on the fruit it probably means they need a few more days to ripen. Branches with a heavy load of fruit may start to pull toward the ground, so if a single branches has more fruit than it can hold, simply remove a few and let them ripen on the kitchen counter to take some of the weight off your tree. What do you do with all those starfruit? This is a really good question! While we eat a lot of them fresh, just like an apple, there is really no better way to show off than to use them as a beautiful garnish. Sliced crosswise, the characteristic star shape really stands out and looks great against a dark plate or spread on a salad. I’ve recently found a few other recipes that sound interesting- let me know if you’ve tried them and how they turned out! 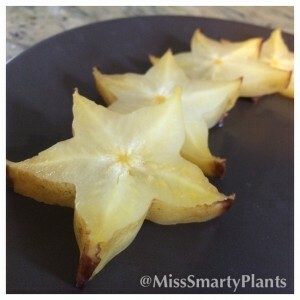 Starfruit Chips from Epicurious.com. I haven’t had anything bad yet from Epicurious so I look forward to testing this recipe. Carambola Pickles from the Food Network. Huh. I don’t know what to say about this… I guess it is worth at try. Star Tea. Yep! This is the first one I will be testing. Sounds delicious and looks beautiful. modify it yourself? Anyway keep up the excellent quality writing, it’s rare to see a great blog like this one today. My star fruit always drop their fruits while its still small. How do I prevent that? Is it dropping all of the fruit or just some? Most fruit trees will begin to set more fruit than they are actually able to produce and will drop some as it matures. Starfruit are also prone to wind damage, so if you are in a very exposed location that might be part of the issue as well. 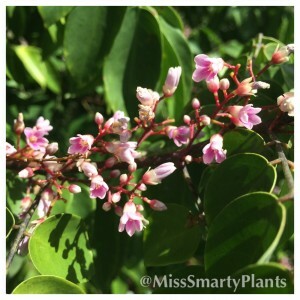 I have a carambola tree in the ground, maybe ten feet tall. Planted likely in November. The tree started growing leaves a week or two ago, and noticed that some of the new leaves are yellow and fell off when I touched them. And as usual, wonder, am I watering too much or too little? Well, have you been watering it a lot? If water is the cause of this, it has to be extreme (either you’ve never watered or you are watering four times a day). I would suggest that if the leaves are yellow you apply some citrus fertilizer around the base of the plant and water well. 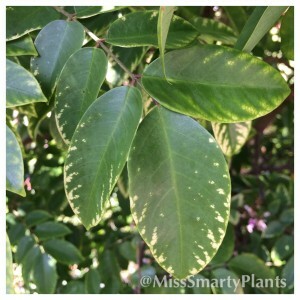 I suggest citrus fertilizer because it has many of the micronutrients to help your new tree thrive. My starfruit tree branches are growing in a lateral to downward direction, is this normal? Lateral branches aren’t unusual. Is your tree starting to bear fruit? It’s not unusual for branches to get heavy with fruit and start to bend downward. 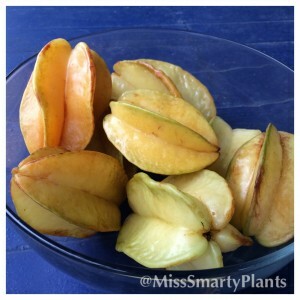 The good news is that starfruit trees are very fast growing, so I wouldn’t hesitate to just trim off any branches growing in an unusual (or unappealing) manner.